Given the conflicting views and opinions surrounding the current state of the U.S. economy, we thought it would be a good idea to look at the facts and the figures for the first half of 2017. 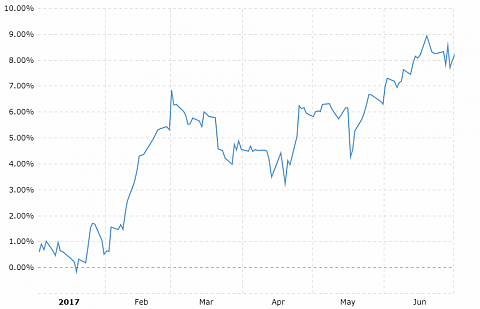 •The S&P 500 Index was up 8.24% as of June 30 (and has risen to a 9.91% YTD increase as of July 18). • The Down Jones Industrial Average was up 8.03% as of June 30 (and has risen to a 9.26% YTD increase as of July 18). 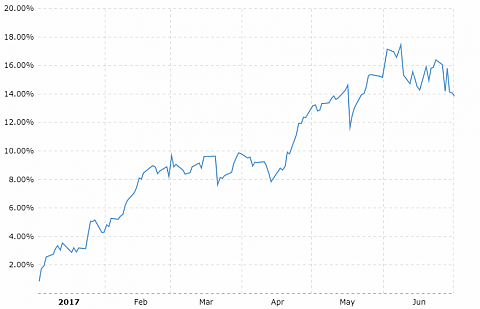 • The NASDAQ Index was up 14.07% as of June 30 (and has risen to an 18.32% YTD increase as of July 18). • The U.S. unemployment rate dropped from 4.8% to 4.4% as of June 30, with approximately 658,000 more people employed that at the beginning of the year. • U.S. GDP grew at an annualized rate of 1.2% for the first quarter of 2017 (second quarter data are not yet available). Projections for 2017 as a whole are for overall annual growth of ~2.1%, compared to 1.6% for 2016. • The return on 10-Year U.S. Treasury Bond declined from 2.45% as of January 1, 2017 to 2.30% as of June 30, 2017, and has dropped since to 2.26% as of July 18. • Crude oil prices fell from $53.72 per barrel as of January 1, 2017 to $46.04 per barrel as of June 30, 2017. What Does this All of This Mean for the Second Half of 2017? There are conflicting projections by the “experts.” Some point out that the current combination of low unemployment, high asset prices, central banks’ tightening of monetary policy, and lack of market volatility are precursors to a recession. Some express concern that the lack of volatility in the stock market is producing lackluster trading in commodities. Others, however, consider current rising economic strength and strong corporate earnings to be reasonable support for both current market prices and an optimistic outlook for the remainder of 2017. Despite an increase in consumer confidence (see below), other economic data reveal caution at work – the Personal Consumption Expenditure Price Index (PCEPI) has risen only slightly, from 111.632 as of January 1, 2017, to 112.127 as of May 31, 2017 (the latest data available), an increase of only ~0.87%. This indicates that consumers are weighing purchases, rather than rushing to spend. Concerns over possible interest rate hikes and potential divestment by the Fed of a portion of its current bond portfolio seem to have been alleviated by Ms. Yellen’s recent statement that the Fed would “remain flexible,” and that any divestment and/or interest rate increases would be undertaken gradually. Markets have responded positively to her statements reflecting concern about the current low inflation rate, as reflected in both the CPI, which for the first half of 2017 increased at an annualized rate of only 1.6%, and the PCEPI (see above). In June of 2017, the Fed raised short-term interest rates for a third consecutive quarter, from a range of 0.75% to 1.00% to a range of 1.00% to 1.25%. Further increases are expected in September and December of 2017. Consumer confidence is up, measuring 100.81 as of June 30 versus 100.43 as of January 1, and compared with 100.33 at June 30, 2016. Job creation remains reasonably strong. At RFG, we are not “market-timers.” We believe strongly that a well-diversified portfolio, tailor-fit to a client’s specific needs, goals, financial picture, and personal risk-tolerance, is the better way. Such a portfolio should be reviewed regularly, and re-balanced as necessary to meet changing needs and goals. Be aware, then, that when considering how best to invest your hard-earned assets, one-size advice does not fit all. The best financial planning is uniquely tailored to unique individuals’ needs, goals, and aspirations. Call us today – we can help you position yourself to protect your assets and family, while helping to secure the future you and your loved ones deserve. Stay tuned to our blog for updates and commentary.